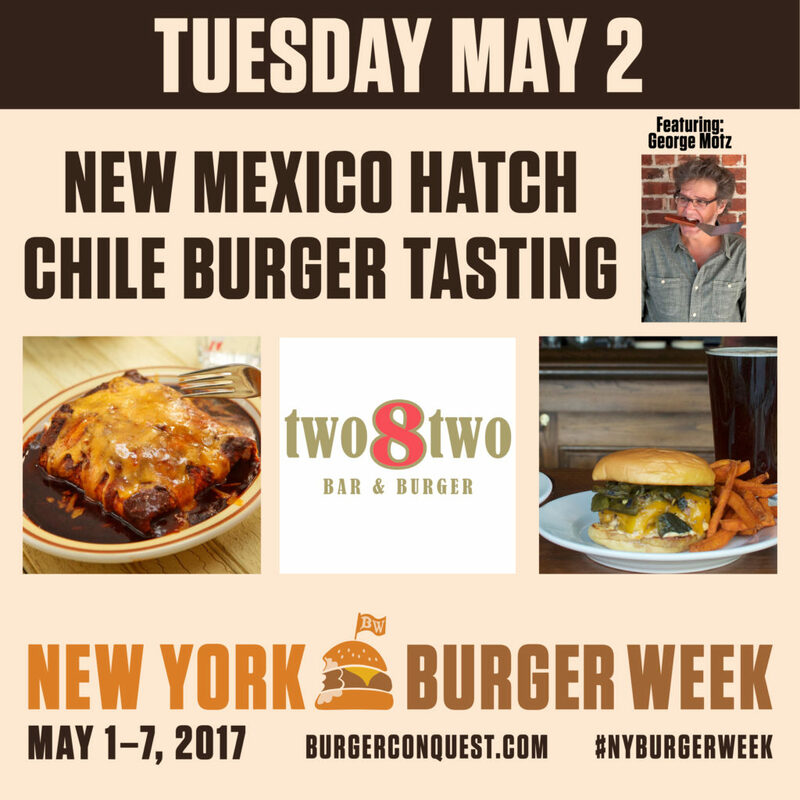 To celebrate National Hamburger Month, Burger Conquest & Rev Ciancio proudly brings you the annual NY Burger Week, May 1-7, 2017.
two8two Bar & Burger has one of the best Burgers I’ve ever eaten and its topped with green chiles from New Mexico. They’re only available for a couple weeks a year when the crops come in and owner Billy Thanopoulos can get a supply shipped into NYC. Its a phenomenal Burger eating experience. But like I said, its only available a couple weeks a year. Don’t let that stop you from heading to Brooklyn right now to eat there. 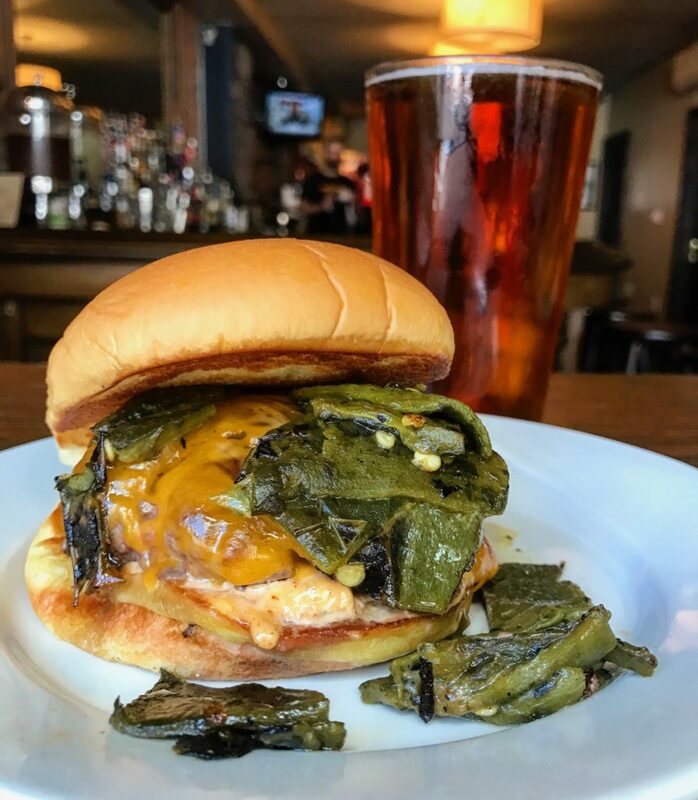 Not only is the rest of the menu totally delicious but they have a roasted poblano Cheeseburger that will knock your socks off! 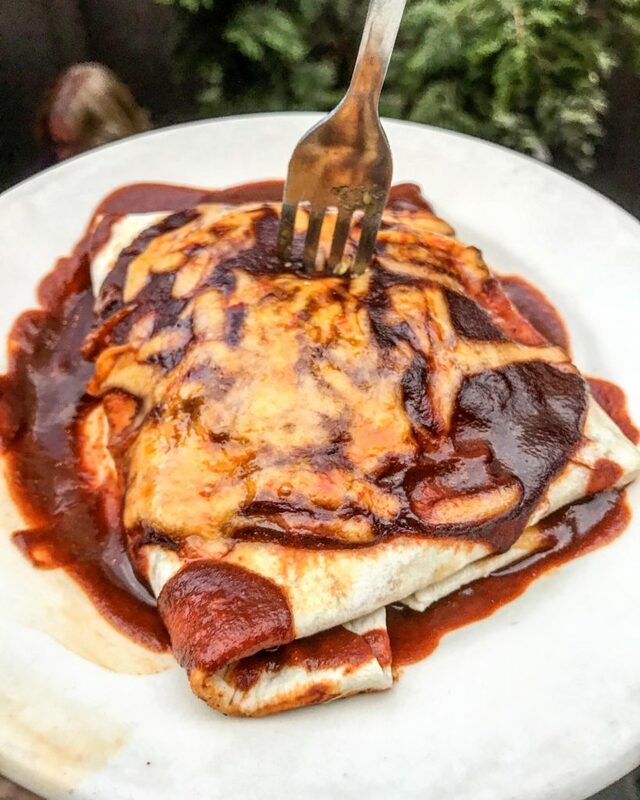 When it came to planning events for this year’s NY Burger Week, I was dying to put on a New Mexican Chile event that really serious foodies would appreciate. I knew there were only 2 people who would be able to help me do that for you, Billy and George Motz, the world’s foremost Hamburger expert. Thankfully they both got really excited about the event. However, we couldn’t confirm the event until not only could Billy ensure he would be able to get some chiles out of season but also that his kitchen staff could nail in the red chile tortilla found in George’s book. That latter one was really a big worry. 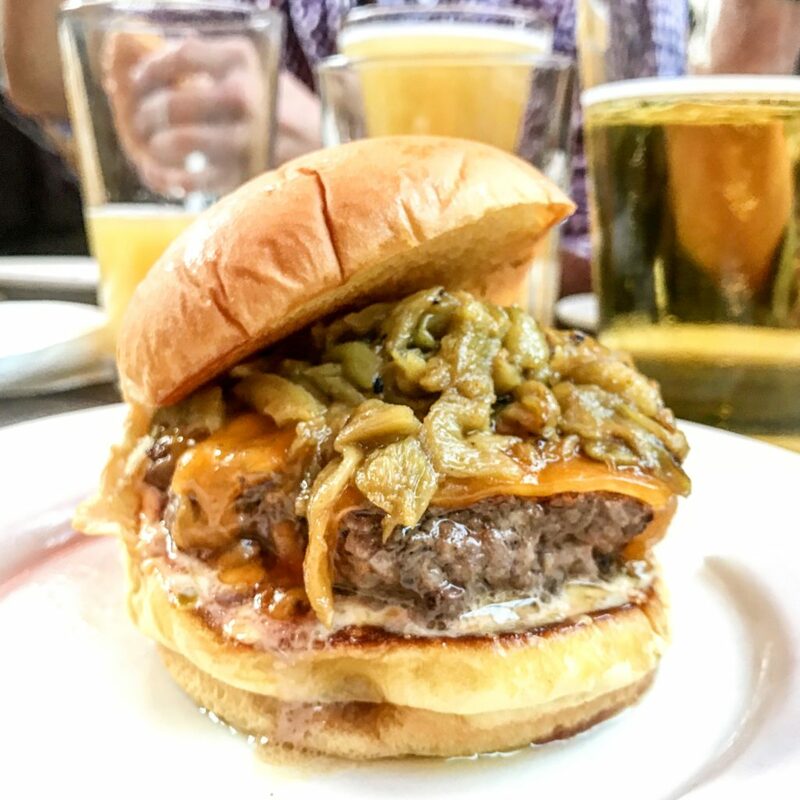 If you have ever been to the South West and are a Burger fanatic, you may have had a hatch green chile Burger. They are highly regarded as one of the best styles of Burgers out there. Hatch chiles coming from New Mexico where there is even a Green Chile Cheeseburger Trail! 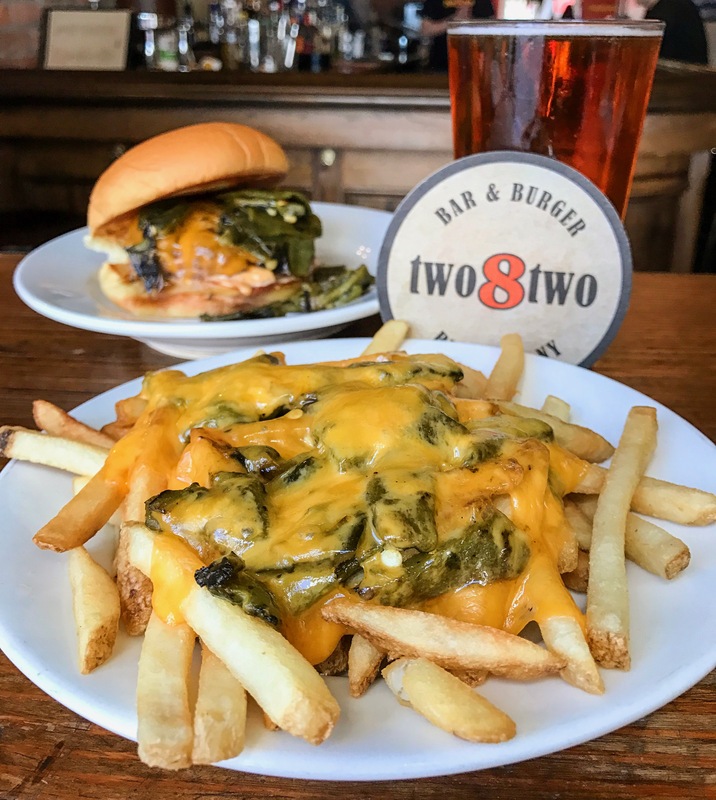 The folks at two8two Bar & Burger along with some help from Burger expert George Motz have been able to procure both green and red hatch chiles for this special event. 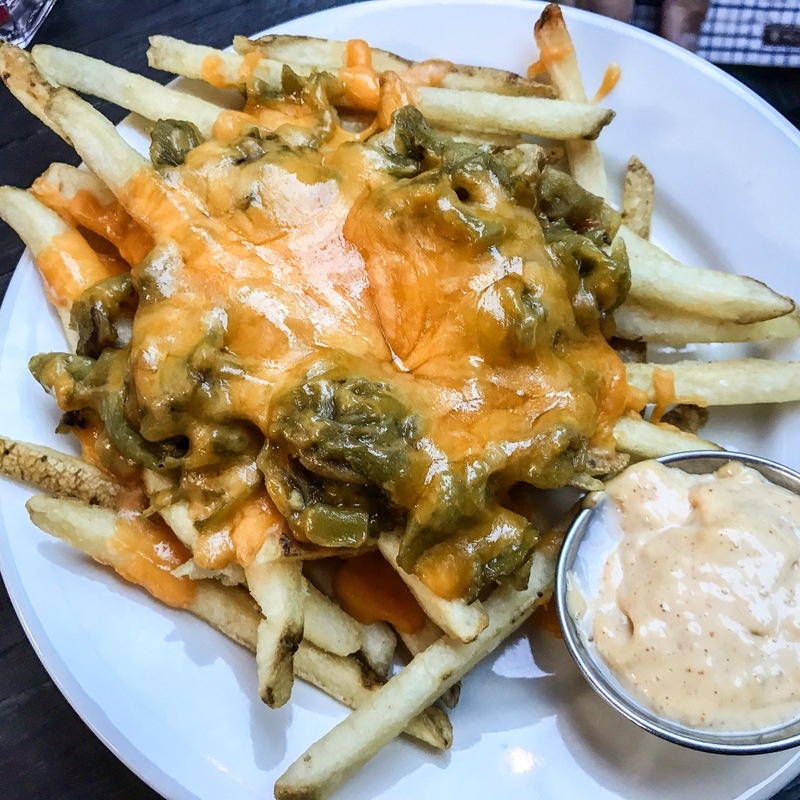 You’ll be treated to loaded french fries topped with hatch green chiles as well as 2 off-menu hatch chile Burgers. 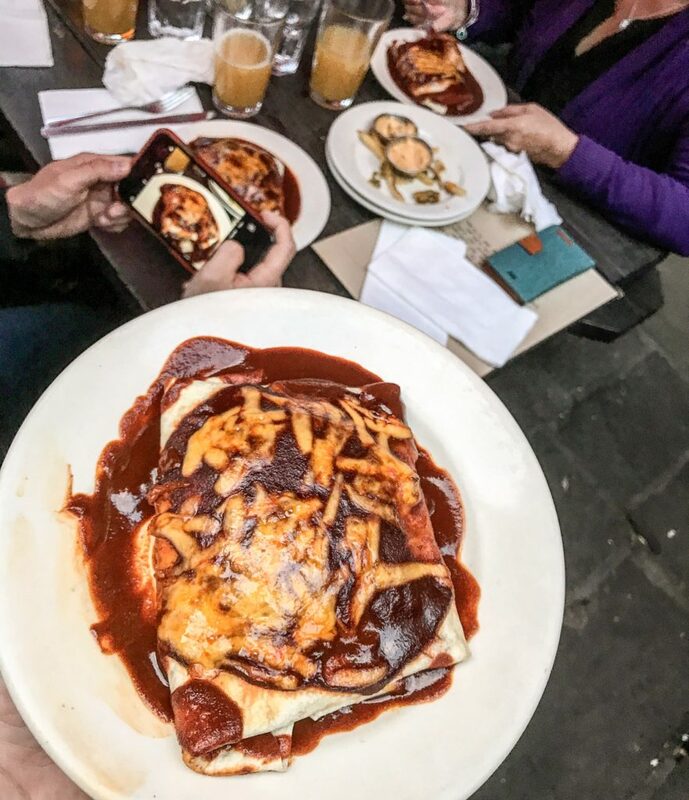 One of which, the Tortilla Burger made with red hatch chile sauce, can be found in George Motz’s book, Great American Burger Book. George will be on hand to give you an “eatucation” and history of the hatch chile as well as sign copies of his book. Thank you to Billy for working so hard to put together an event that just doesn’t happen in NYC. In fact, George and I believe the red chile tortilla Burger has never and only this one time ever been served in New York City. 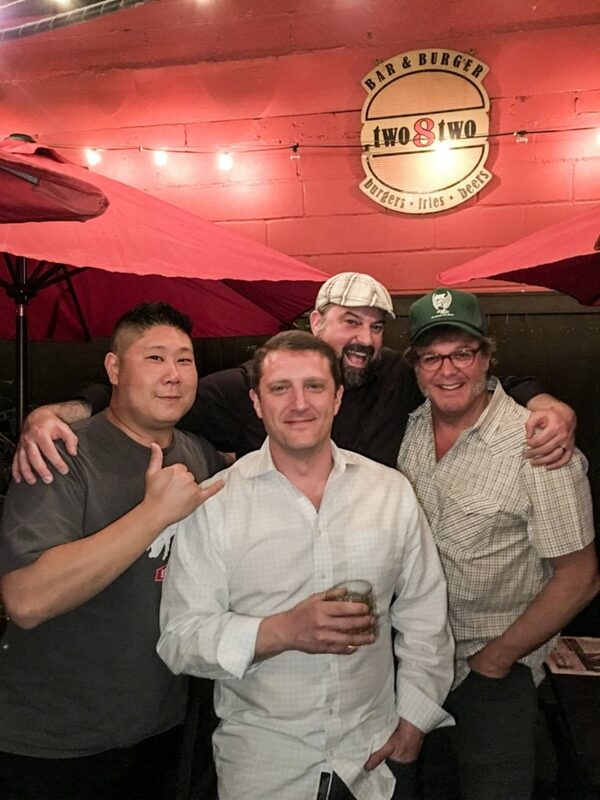 Thank you to the entire staff of two8two for seamlessly juggling an intense event with off-menu food and a full dining room at the same time. These types of dinners are not easy to do and you guys all made it really fun. Thanks to all the guests who came to join us for this really intense food exploration. I hope you enjoyed it as much as we did. 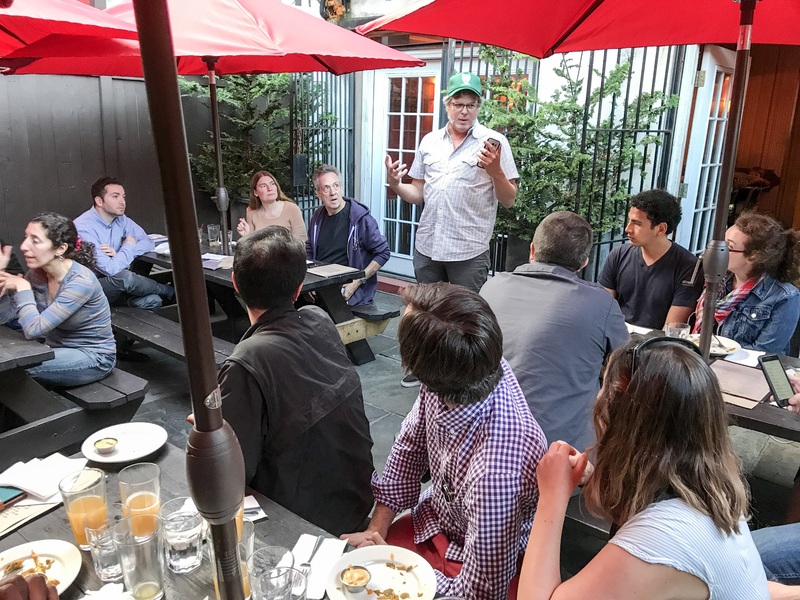 Thank you to George for being so enthusiastic about the idea and helping the rest of us Burger lovers to go a little deeper into what makes us appreciate food. Thank you also to special guests Stephen, Billy, Maddie, Fletcher, Kathy, Sydney & Dan. You guys made it really fun. This entry was posted in Brooklyn, Burger Week, New York, NY Burger Week and tagged cook book, george motz, Great American Burger Book, green chiles, hatch green chile, NY Burger Week, NY Burger Week 2017, rev ciancio, tortilla burger, two8two. Bookmark the permalink.